That’s how you shatter a ginger jar. or cause the hairs to explode? Parenting is surely one of the most challenging tasks. This I acknowledge with deep sincerity and appreciate all my parents have done for me. But poetry will have its way. I head off to find Christmas. and hooks up the chain. My paternal grandparents had a beautifully illustrated copy of The Night before Christmas published by Little Golden Books. To me those pages smelt of sweeter Christmases in the past where children ate candy-canes and hung up stockings over a fireplace. This was the same Christmas of The Nutcracker’s Sugar Plum Fairy, so it is not surprising that sweetness filled the nose and tempted the taste-buds. Magically, unlike the other books in the dust-coated shelves, it did not smell musty. The paper itself was sturdy and even in those days, to my childish eyes the illustrations had an old-fashioned look about them. The atmosphere of expectancy and magic built up at the poem’s opening inspired my musings on this quiet evening. With gifts wrapped, cards distributed, Christmas baking done, bags packed, and now even the front door bolted, it seems that all that there is left for me to do is board my train at Euston tomorrow. The second part of The Night before Christmas bounds with abundance and jollity. With St Nick and the reindeer enters a quicker pace and the energy of the festival. It is that part of the holiday to which I’ll be travelling. However, here in the quiet before the fracas, here I write next week’s posts at my desk, muesli consumed and coffee at hand. Yet again, an item that could not be delivered. The card through the letterslot. Last one for the shift. I could do with some tea. A companion piece to Monday’s poem, “Without realising it, the postman leaves a poem”. As an exercise, this poem is written from the point of view of the postman. I’m now wondering about a poem in which the postman is the poet. It could not be delivered. I have produced two books of poetry. The poems of my first volume draw on experiences of my youth. Shining in Brightness includes poems that explore young love and infatuation, trying to forge a creative path and remember the father I lost to cancer. The second volume is dedicated to contemporary men, aka ‘the Modern Boy’. The poems filter advice and insights through the voice of a character called Emily. Preview Emily’s Poems for Modern Boys here. with a bit more flexibility. with a ruler, fully naked. the ruler has been on a raft. the people sing and dance. We also have operations in Cambridge, Bristol and Brazil. is a good policy tool. Another poem in part inspired by an exhibition currently on in London – Beyond El Dorado: Power and Gold in Ancient Columbia at the British Museum. The museum hosts accompanying free lunch-time lectures presented by curators and experts in the field, a few of which I have attended recently. When the lectures open, I sit up attentively relishing every new piece of information. I must remember this, remember that. But the open notebook on my lap fills with doodles and interesting snatches, not of content, but of expression that comes out of the lecture. In part this poem consists of jottings from the BM lunch-time lecture on El Dorado that I attended. The other bits are derived from the sort of meeting jargon anybody who has worked an office job may well recognize. This last weekend I did lots of kicks. Yesterday, I did enough repetitions of cloud hands to wake up with aching arms. Are you ready for Christmas? I am far from, but did issue my second book of 2013 in time for its November deadline. Preview Emily’s Poems for Modern Boys here. Shining in Brightness, my first book of poetry came out in February. The verses draw on 12 years of travels, study and growing up experiences between the ages of 18 and 30. Peruse some of the poems and accompanying essays here. Both Emily’s Poems and Shining in Brightness (pictured above) are available as old school, cover-and-paper volumes via my blurb bookstore. I continue to pen poems towards my 2×52 project. The aim is to write two poems a week for 52 weeks, to total 104 poems across a year. The most recent four poems use the subject matter of martial arts, eating a boiled eggs and wedding celebrations to explore the themes of relationships, directing one’s action towards a goal and dissolved projections/dreams. have left for the sea. As hinted at last week, here is the poem about grooms flocking to the valleys. It was spurred by a dictionary explanation of fiancée that read “He went back to the valley to marry his fiancée.” In my accompanying essay to last Thursday’s post, “I do. Do you?”, I explain my wonder at such a contextualising mini-narrative. I also predicted a sprouting poem. As a companion read, I recommend Liz Berry’s wonderful poem “The Year We Married Birds”. Hereunder my favourite line, no less because of the colon. It’s a busy marriage market out there with hartebeests in the valleys and magpies, Trafalgar pigeons and snow buntings in the cities. Too bad the brides have left for the sea. P.S. The hartebeest is species of antelope. Still looking for a completely original Christmas gift for a bibliophile? Preview my books of poetry. 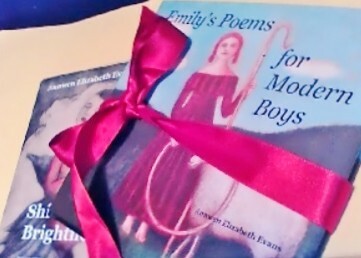 Emily’s Poems for Modern Boys – Fresh off the press! 25 poems on life, love and work derived from the field-notes of an observant poetess. Shining in Brightness – 20 selected poems chronicle twelve years of travel, relationships and growing up. Praised as “jewel-like droplets in a grey, urban landscape”. Find Beaded Quill on Twitter (as @BeadedQuill) and Facebook. Not to fear. Come the end of next week, I plan to be on a waiting-list to freeze some of my good eggs. Plus the poetry writing continues. I now have two volumes for sale. The latest book, Emily’s Poems for Modern Boys, offers insights on life, work and love for the youthful gentlemen of our contemporary times. Shining in Brightness chronicles a twelve-year journey set across three continents and explores the themes of connection, loss and growing up. Please follow me on Twitter as @BeadedQuill. I tweet about writing and whatever else is happening in my life. At the moment this is a cold and listening to Chopin Ballades.